The babies will be 11 months old this weekend, and the closer their birthday gets, the more I have flashbacks to this time last year, my last (huge!) month of pregnancy and the girls’ birth. And a funny thing has been happening– such a thing of grace. The babies’ birth wasn’t exactly a sweet and simple process. The first two weeks were perhaps the hardest weeks of my life, and for a long time, just the thought of a hospital room made my stomach ball up in knots. But recently, I’ve looked back on those days with a tenderness and thankfulness that could only come from God. At the time, those days felt endless. I functioned on less sleep than I thought was possible, and shuffled painfully down the long hallway between mine and Catalina’s room in the postpartum wing and Lucy’s little NICU room more times than I could count. This was not how I had expected things to go, and not how I thought a NICU stay would feel. We were separated, I was pumping for Lucy and struggling to nurse Catalina, and no one could offer a timeline for when we’d be home together. I knew in my head that God’s will is always perfect and that He was lovingly sovereign over our situation, but I felt distant from Him, and even that took me by surprise. There were many moments of deepest joy– I had my babies, after all! I soaked in every new baby smell and grunt and cuddle. My family was there, and friends were eager to help us. But I was often sad, exhausted, and a little ashamed of not being more cheery. I wished I was peacefully waiting on the Lord and enjoying my babies, NICU or no NICU. I wished I felt like He was working out everything for our good, but I was seeing the short-term and I couldn’t stretch my gaze any further. But now when I look back, I see how the Lord’s steadfast love was covering us as He promised. Unlike so many NICU babies, Lucy was just a “feeder and grower,” and I could leave her room expecting her to be safe and healthy when I came back. There were so many fun and sweet family moments, and I’m so thankful Catalina was with me and not with her sister. And only a miracle could have kept me going on two 45-minute snatches of sleep every night! We made it out of there in less than two weeks and began life at home as a family of four. 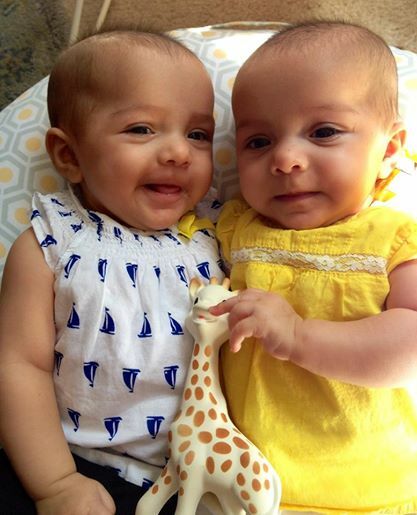 As Lucy and Catalina’s birthday approaches, I’m celebrating more than just their first year of life. I’m celebrating things my hugely pregnant self didn’t dream I’d learn soon. A kind of trust that comes only from experience. I may not have been worshiping then, but every time I look back now, I can’t help but praise God from whom all those blessings flowed, even when I couldn’t yet see them.